Deal or No Deal Slingo: Go for the £100k Jackpot! There are a number of games that are based on popular TV shows, however, not all of them are successful. 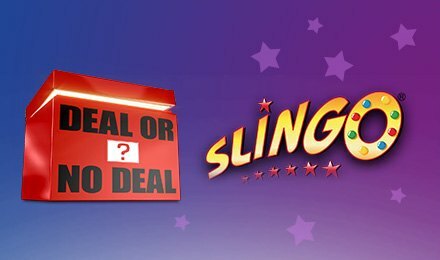 Deal or No Deal Slingo is definitely one of the successful one. This Slingo game is based on the iconic TV show by the same name. This game uses a 5x5 bingo card, but the numbers on the card have been replaced by the numbered red boxes made famous by the TV show. Each of the boxes has a hidden prize and carry amounts listed on the red and blue pay tables on either side of the bingo grid. This one of the more complex Slingo games, so it would be wise to understand the game well before you put real money into it. Before you start the game, you have to set your wager. The minimum bet here is £1 and the maximum bet is £100. The values on the pay tables will change depending on the size of your wager. Instead of 25 boxes, you get 26 boxes when you start the game. You have to choose 1 box, which is then set aside, while the other 25 then convert to the 5x5 bingo grid for the main game. Now, you press the SPIN button. You get 10 spins per game. Every time a number on the reels matches one on the grid, the contents of that red box are removed from the game and added to your winnings. Every time you find a numbered box and the contents are opened, that value is removed from the red and blue pay tables on either side of the grid. To get a Slingo, you need to open 5 boxes in a row, column or diagonal. Every time you win, the prize multiplier meter on the left of the grid rises. Deal or No Deal Slingo has a few special symbols that help make a win easier to achieve. Joker:This is the wild symbol and it can unlock any red box in the column on which it appears. Super Joker:Another a wild symbol, the Super Joker allows you to unlock a red box anywhere on the grid. Free Spin: When this symbol appears on the reels, you get a free spin that can be used after you have exhausted your spins. The Devil: Beware of the Devil, for he can prevent you from making possible matches. If you manage to win 4 Slingos then this bonus round is activated. The Banker will offer you a deal – a cash amount for that box you had put aside at the beginning of the game. You need to take the decision of a Deal or a No Deal. If you accept the offer, then the game ends. If you want to play on to see if you can reach the jackpot, you reject the offer. If you have not managed to get 4 Slingos by the end of the game to activate the Banker’s offer bonus round, then you have the option of ending the game or buy extra spins to play Slingo. However, be careful about the extra spins you buy since they get progressively more expensive. Every Slingo you get will move you up the prize boost ladder, and will multiply the value of each remaining prize!